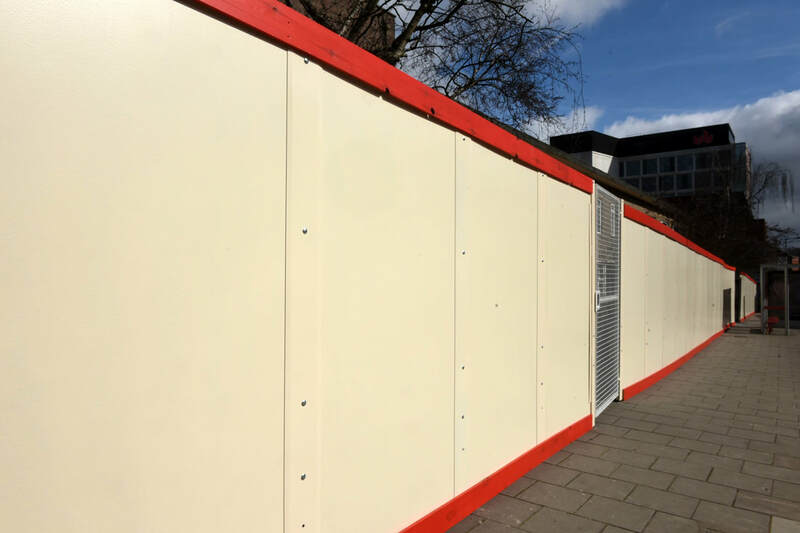 As part of my time on the testbeds artist accelerator programme I have partnering with the The University of Bedfordshire (UoB) to access hoarding space along the University’s STEM (Science, Technology, Engineering and Maths) development site. As part of this STEM project I developed a model of outreach to engage people studying and specialising in scientific subjects to develop an artistic concept for this urban development site. This concept, formed from interdisciplinary workshops explored perceptions of space and identity with an overriding aim to improve civic pride amongst local young people. I chose to work with Stockwood Park Academy Sixth form science students as they would have knowledge in a subject linked to the STEM building site that would inform my artistic research, and as local young people who would gain the most out of a project linked to this site. 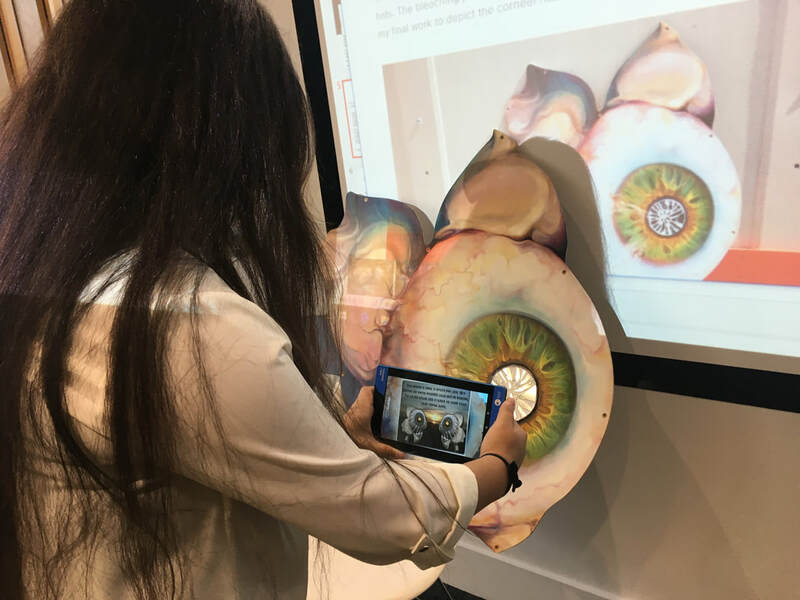 after initial sessions exploring themes of perception, the human eye, art and technology and Luton I found students had a mixed view of their town. 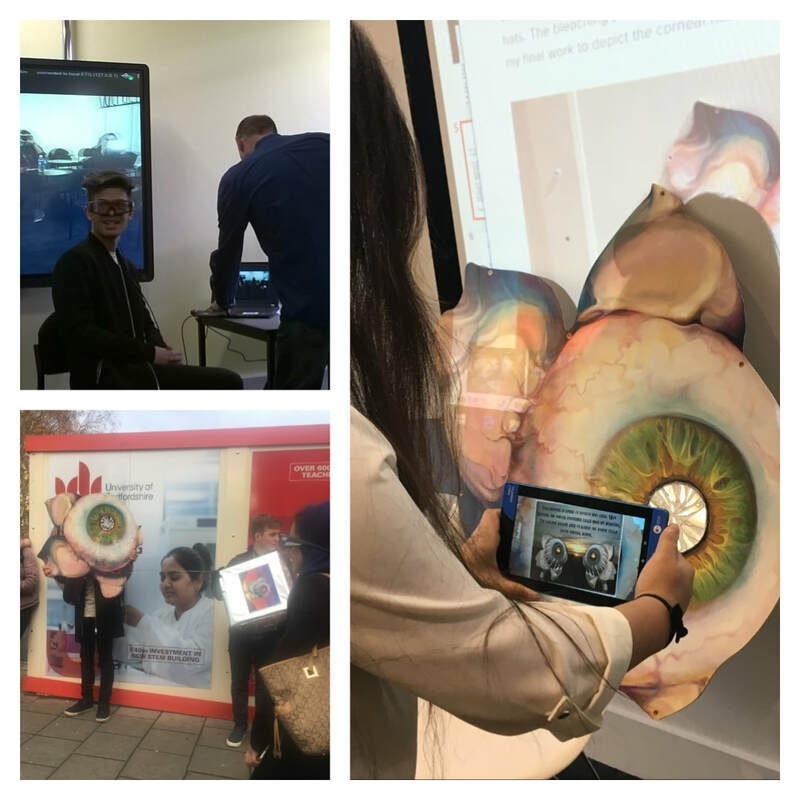 To develop an artistic concept around their views I arranged for an interdisciplinary day at the University of Bedfordshire engaging the students with the STEM site and the school of psychology as a subject relevant to their studies. 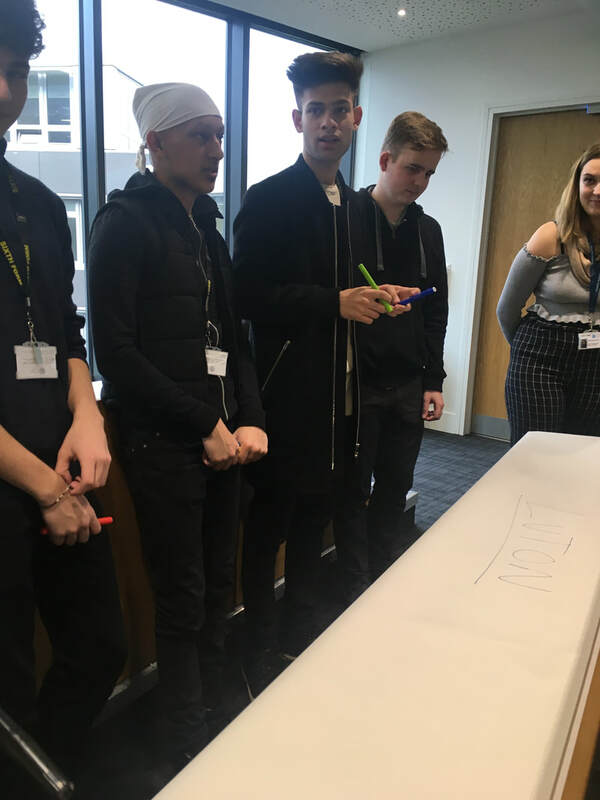 To explore themes of Luton, science and perception further, and come up with an artistic concept for the STEM site I invited the group of students to the University of Bedfordshire. We took a day to look at perceptions and optics in psychology, working with Dr William Brown and Senior technician Paul Cavendish from the Universities school of psychology. This formed the basis of our concept, a portrait of Luton's identity. ​We then used an adaptation of the psychological 'Brunswick' experiment to pick three faces that they felt most accurately depicted ‘depressed’, ‘dangerous’ and ‘optimistic’, three words they used to describe Luton. This formed the basis of our concept, a portrait of Luton's identity. To engage the students with the STEM Hoarding site Paul Cavendish assisted me in setting up an interactive workshop. 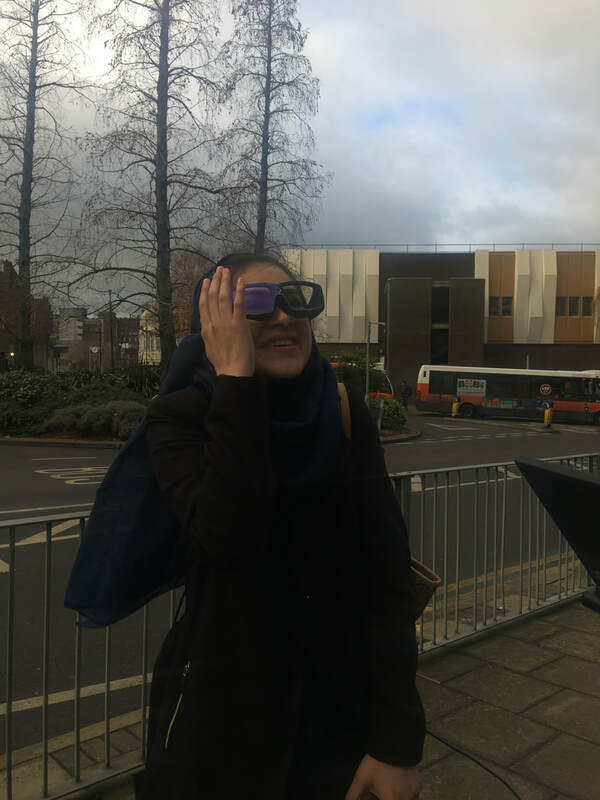 Eye tracking goggles were used to track the eye movements of students whilst walking past the site. 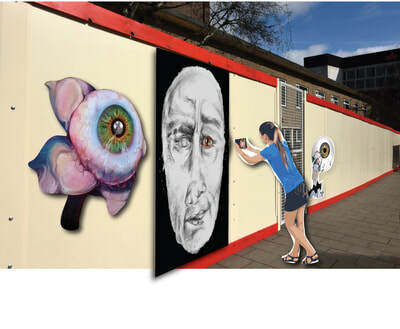 Students were then asked to walk the same route, however this time artwork took place on the hoardings. 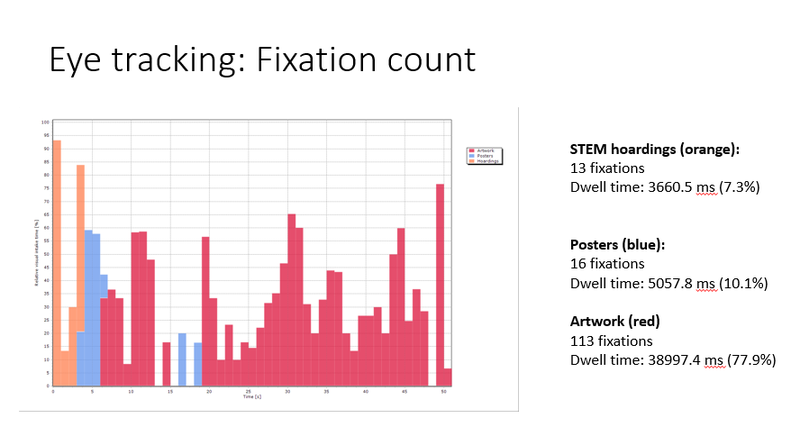 Results from this experiment show the potential in using interactive artwork along sites to engage the public. The last workshop I underwent with the group looked at the joint research we underwent in the last sessions and how our interdisciplinary explorations came together to form a comprehensible artistic concept, which the group directly informed, giving them a sense of pride in the concept and when developed a physical connection to the STEM site via a piece of public artwork. From the basis of the portrait we established. To using the groups discussion about Luton from a personal point and from the view of the media. 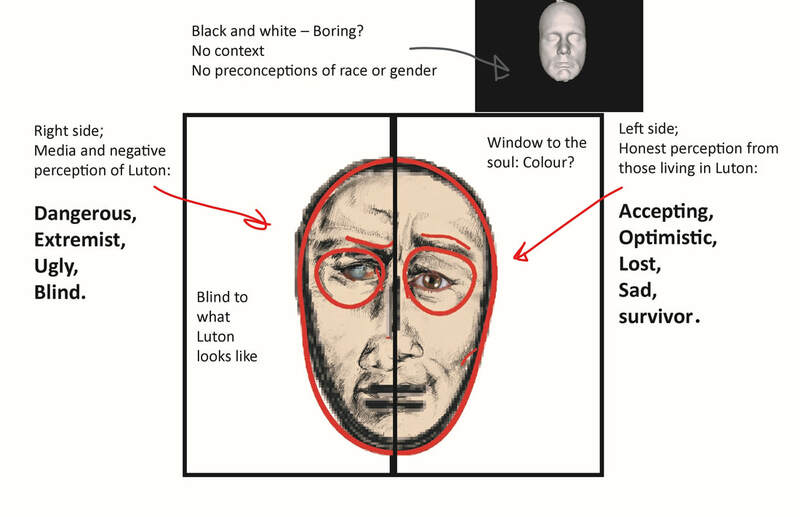 Even incorporating psychological research into reading the honest side of the face as being the left, therefore that being the honest side of our portrait, and using black and white as we discovered 3D facial scans do so and remove any context, preconception and stereotypes the portrait could hold. Partnership with the University of Bedfordshire is ongoing to develop the concept portrait into a truly interactive artwork to be installed on the STEM hoarding site, which uses technology to engage the public and open a social discussion about Luton's identity.